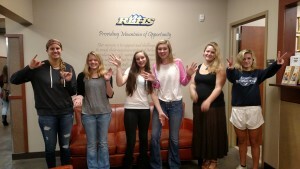 Tuesday the 19th, was a great day for Red Lodge High School students! Volunteer hours were announced and the students with the most hours were recognized and received gift certificates to some of their favorite places around town. An ice cream party was held for all high school students since there was such fantastic volunteer participation this year. Just from this past semester 120 students were able to rack up 1090 hours, bringing up the total amount of volunteer hours for this year to 2250 hours. These awesome volunteers had a significant impact on our community this year; let’s hope they keep up the good work and complete even more hours next year! Thank you to all students who participated, and a special thank you to the students who completed more than 50 hours, including; Jill Purcell, Kendall Prather, Kylie Kelly, Emily Johnson and Laura Nearpass. Are you a student seeking volunteer opportunities or a person in need of a youth volunteer? Contact Rue Freeman at the Red Lodge Area Community Foundation via phone at 406-2820 or email at youth@rlacf.org.